South Korea is to reopen its Tripoli embassy in September and allow its companies to return to work in Libya, Libya’s Presidency Council revealed yesterday (Photo: PC). South Korea is to reopen its Tripoli embassy in Tripoli in the beginning of September and will allow its companies to return to Libya to resume their stalled projects. 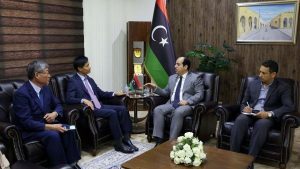 The important revelation came after a meeting between South Korea’s ambassador, Choi Sung-Soo, and Presidential Council Deputy Ahmed Maetig in Tripoli yesterday. Choi Sung-Soo was reported as saying that his country would begin the official approval of South Korean companies implementing housing and construction projects and housing units to return to complete contracted projects. Ways to develop joint cooperation between the two friendly countries in various fields and practical steps on the return of Korean companies were also discussed, Libya’s Presidency Council reported. No further details were provided by the Presidency Council. However, it will be recalled that the Faiez Serraj-led Presidency Council’s Presidential Guard offered in April this year to provide security for South Korean companies. The offer had been disclosed by the Presidential Guard during a meeting between the South Korean ambassador Choi Sung-Soo and the Commander of the Presidential Guard, Najmi Nakua. The Presidential Guard, it will be recalled, is the attempt by the internationally recognized Presidency Council based in Tripoli to form an official unified Libyan army loyal to and under the direct control of the legitimate civilian government. On the other hand, the so-called Libyan National Army (LNA), based overwhelmingly in the east of Libya, is under the command of Khalifa Hafter and recognized by the Tobruk-based House of Representatives. The April meeting between Korean ambassador Choi Sung-Soo and the Commander of the Presidential Guard, Najmi Nakua followed on from a meeting by Choi Sung-Soo with Deputy head of the Presidency Council last Monday, Ahmed Maetig. At that April meeting, it was noted that Korean engineers had already prepared reports with a view to resuming work in the summer of 2018 and the possibility of the reopening the Korean embassy ‘‘in the coming months’’ had also been discussed then. Ambassador Sung-Soo had expressed in April the readiness of Korean companies to resume work in Libya ‘‘in the event of security guarantees and the right environment to complete the projects’’. Ambassador Sung-So had added that his country also looked forward to increasing the size of their projects in Libya, to include construction and housing projects and to equip schools in accordance with requirements. He had also referred to the training programme between Korea and the Libyan Ministry of Labour to train technicians in several disciplines. Maetig had confirmed the willingness of Libya to take advantage of Korean experience in the field of e-government as needed in “customs, banks, passports, medical supplies”, and work on the dispatch of specialists for training in Korea. It will also be recalled that a number of Korean companies working in the electricity-generation sector had over the last months visited their project locations in Libya with a view to returning. This is not the first time that there have been discussions between Libyan authorities and the Koreans about restarting stalled projects. In August 2017 representatives of Korean companies had held talks in Tripoli regarding the possibility of their return to resume their stalled projects. However, issues regarding payment and more importantly security had always been a stumbling block. However, it now seems that the South Korean authorities are satisfied with the level of security in Libya to the extent that they are prepared to open their embassy – in line with a number of other states such as Italy, UK, Netherlands, and Turkey – and to allow their companies to return and resume their stalled projects.